About 4 hours or so from San Francisco, we retreated into the quiet, fragrant woods of northern California. We opted to drive the Avenue of the Giants, a scenic byway within Humboldt Redwoods State Park that basically parallels the main road and offers a free glimpse at these huge trees. If you’re in the area and passing through, absolutely do the Ave of Giants; it’s worth the extra time (and, again, it’s free). We explored a grove near a turnout, then went straight to the campground, with fingers crossed that we didn’t need a reservation. Our timing couldn’t have been better, because the campground would be closed for the season in just a few more days. We lucked out yet again, finding a great campsite that was tucked away, a short walk into the woods from the parking spot. It was almost like backcountry camping, a bit different than the normal tent/RV city. Also, we had the feeling that we were actually surrounded by nature. Yep, we awarded Humboldt the title of best state park. The next morning, we stopped at the visitors center, which was surprisingly informative and entertaining. One draw was the incredible taxidermy exhibit, showcasing the variety of animals to be found in the area. Also, the eager-to-help volunteers gave us some great tips on what to do in the park with only a couple of hours to spare. Humboldt houses a bunch of the world’s tallest trees, and the trees exist in their natural glory (with the exception of Giant Tree, which had a bit of a walkway around it). 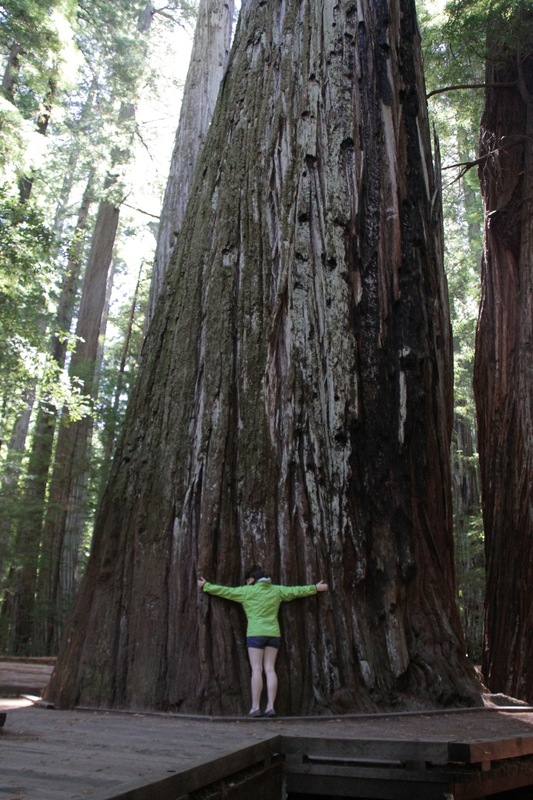 It is incredibly humbling to stand next to a living thing so large, and with such a vast history. Kristen and Loren are both lovers of trees, and Redwoods especially, after having read the fantastic book “The Wild Trees.” If you’re at all interested in climbing, trees, and/or biology, you should definitely read this book. The book details the recent attempts at finding and measuring the world’s tallest trees, and the ecosystems that exist at all levels of the tree - especially in the sky-high canopy. We both wished we had the book on hand to turn to pages mentioning the specific trees we were admiring. Unfortunately, the State Park has trouble keeping the book on its shelves, it sells out so quickly; it’s been backordered for months now (though the National Park had it...). Not too much further north lies the Redwood National Park. Since we spent a bit longer than expected in the state park, our timing was a bit off: we arrived too late to grab a backcountry camping permit, which basically meant we needed to make it out of the park for camping. So, with limited time, we tried to explore what we could of the park in and not too far from the car. That left us a few options, and we did a couple of short hikes that gave us a taste of the park. Circle trail and Cathedral Tree trail were two favorites. We couldn't resist stopping to take a photo of the giant statues of Paul Bunyan and Babe, at the Trees of Mystery tourist trap, just off 101 near the National Park. We also paid a visit to a small grocery inside the park and bought a few essential items, including veggies, eggs, avocados, sausages (for that night), and the best camping food choice yet: yams (more on that in a later post). A bit sad we were already leaving the park, we kept moving and arrived at Patrick Creek Campground, about 45 minutes north of the National Park. Despite having beautifully mild weather, we had to bundle up because the campground was home to thousands of mosquitos, and we were being eaten alive. Every 10 seconds or so, one of us would say “hold still... got one.” Overcoming that slight annoyance, we made a delicious dinner of grilled sausages and fire-roasted veggies (red bell peppers, onion, and zucchini). We also made friends with our campground neighbor’s dog, a small little black dog (keeping in line with the all-black small animal theme) which we were told was a Chihuahua - Papillon mix. We almost stole her she was so cute. That was our last night in the great State of California. We’d stayed a whopping 15 nights, and it was time to move on. Thanks, California! It’s been great. We can’t wait to come back.